Lars Von Trier is the type of director who’s not scared of polarising audiences. Not content with making straightforward films, he’s instead built up a career by following the more controversial route, exploring topics that are puzzling, difficult, or both – not concerning himself with the dozens of cinemagoers he may be excluding in the process. Melancholia, the Danish auteur’s latest oeuvre epitomises his beliefs and cinematic style in a completely dazzling, meditative fashion: one certain to split audiences right down the middle. Opening with a visually beguiling yet skin-crawlingly ominous prelude that depicts the moment just before the planet Melancholia swallows up our very own Earth, the gloomy tone is distinctively set through eerie slow-motion and frightfully austere imagery. From here, we are taken back in time as the events preceding the end of the world play out over two halves. The first, simply titled “Justine”, is presented as a documentary-like psychological drama and details the nuptials between Justine (Kirsten Dunst) and Michael (Alexander Skarsgård) in a lavish, luxury estate owned by Justine’s sister Claire (Charlotte Gainsbourg) and her husband John (Kiefer Sutherland). The second, titled “Claire”, is a personalised apocalyptic drama, depicting each character’s differing fear and – in Justine’s case – acceptance of the approaching planet. While the first section is laden with smiles and amusement as Justine and Michael’s wedding plays out in an almost comedic fashion – with particularly noteworthy dry wit from the sisters’ parents (brilliantly played by Charlotte Rampling and John Hurt) – the second half is more meditative and emotionally devastating. Trier draws from his own personal experiences with depression to carve a wholly realistic view of how people would deal with the impending apocalypse in their own ways. Some may be put off by the philosophical approach adopted by Trier, but this is a film that pays dividends to those who bear with it. Melancholia should certainly be respected for its refreshing honesty. It may paint a truly devastating picture of what depression, paranoia and hopelessness can do to people, but because there’s a undeniable message hidden beneath the exterior, it makes the portrait all the more authentic. Yes, the proceedings are set against the impending apocalypse, but Trier’s desire to tell a story about the end of a life prevails in his ability to centre its focus on four characters rather than looking at the bigger picture which, in turn, helps to distinguish this from other apocalyptic dramas of its nature. Manuel Alberto Claro’s cinematography is simply peerless. By combining real-life images with CGI, he’s created a film with a distinct classical, artistic sheen. The score, featuring Richard Wagner at its heart, mimics the proceedings seamlessly, slowly building up and up to hit the necessary earth-shattering crescendo come the final moments, all in a beautifully rhythmical and emotionally devastating fashion as we watch on as Justine, Claire and Leo (Cameron Spurr), Claire and John’s son, are engulfed by Melancholia. While Dunst was rewarded for her contribution at the 64th Cannes Film Festival in May, Gainsbourg is far more deserving of this accolade. Her performance as Claire is pitch-perfect as she desperately clings onto the hope her husband has instilled into her that Melancholia will simply pass by Earth, despite her sisters disbelief. Dunst plays Justine as well as she can, but unfortunately she doesn’t have the range to illustrate the character’s increasing depression in a believable fashion. As mentioned above, Hurt and Rampling stand out in their respective roles as Justine and Claire’s parents, while Sutherland and Skarsgård are disappointedly restrained by Trier’s obvious preference towards women, in spite of the fact their involvement incites many of the emotions experienced by Justine and Claire in the film’s latter half. 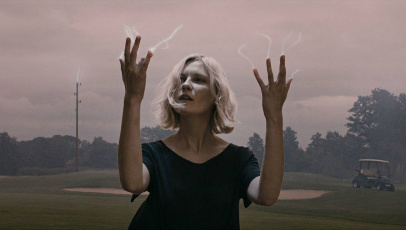 At 133 minutes, Melancholia may suffer from being overlong and thematically suffocating, but its inherent visual beauty, frank disposition and strikingly veritable personification of melancholy certifies its effectiveness, relevance and demand for unfaltering emotional investment. Go in with an open mind and I’m sure you’ll be completely and utterly swept away.